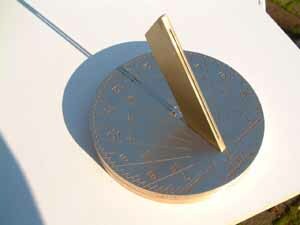 The main feature of the Spot-On Sundial is the divided gnomon* constructed of two parallel plates with a small air gap. This permits a ray of sunshine to pass through for a few minutes at solar noon. 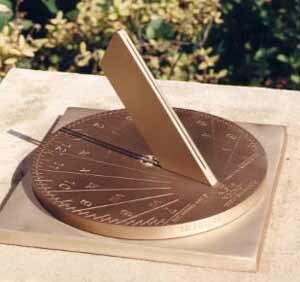 This makes it easy to set up from a table supplied with the sundial. It also gives an "event" (like the noon cannon without the cannon!) each day. As one of our early customers said "It's like having your own private Stonehenge in your garden". 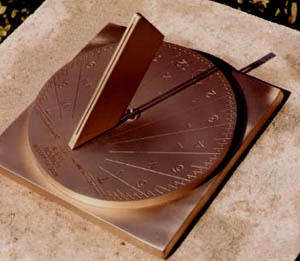 The Spot-On Sundial can be used indoors or out. The rotating dial plate allows the use of the dial on an indoor window-sill; the baseplate is pushed against the window frame, and the dial plate rotated so the sun shines through the slit on the centre line at solar noon. The centre screw is then screwed down to hold it in position. For use outdoors, a level plinth is established, the baseplate is screwed down to the plinth, the rotating dial plate set on the baseplate, aligned exactly at the next convenient solar noon, and the screw tightened to hold it in position, as described in our setup page. 17 cm. square, 12 cm. overall height, weight 4.3 lb. Optional circular baseplate - NEW ! 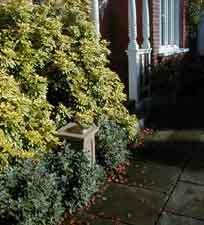 *The gnomon is the upright part of the sundial which casts the shadow. It is derived from the Greek word meaing indicator; the g is silent, so it is pronounced "no-mon" with the first o long.